A couple of fun gigs came my way recently. 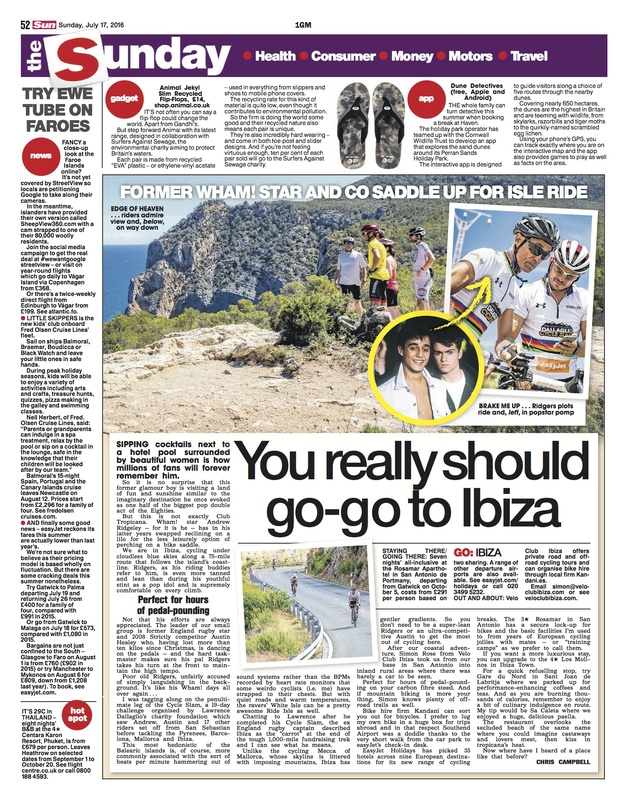 The first was a trip to Ibiza to write a feature for The Sun about easyJet’s new cycling holiday packages. Two of my ride companions were former England rugby player Austin Healey and his chum Andrew Ridgeley from Wham! (that’s them with me in the above picture taken by David Oxberry) who were completing a 1,000-mile fundraising trek for the Lawrence Dallaglio Foundation. You never know who you’re going to meet when you turn up for a group ride, but it will take me a while to top that particular combination. My piece appeared in Sunday’s paper and you can read it here. My second surprise came when Look Mum No Hands! proprietor and erstwhile Dynamo Sam Humpheson asked me to do a few rewrites and headlines for a mini-newspaper he was putting together, the bulk of which I managed to complete while in Ibiza. The freesheet is chiefly an introduction to the Old Street and Brixton cafes for new customers at Look Mum’s pop-up on the Southbank, so grab a copy if you’re heading there or to the two main sites to watch the final stages of the Tour this weekend. The paper is called The LMNH Bugle, which I think trumpets its knockabout tone perfectly. Jen came up with the name when I told her I couldn’t think of one. She doesn’t like to blow her own bugle, so I’m doing it for her. This entry was posted on	July 22, 2016 at 12:31 pm	and is filed under Uncategorized. Tags: Andrew Ridgeley, Austin Healey, cafe, David Oxberry, easyJet, Ibiza, Lawrence Dallaglio, Lawrence Dallaglio Foundation, LMNH, LMNH Bugle, Look Mum No Hands!, pop-up, pop-up cafe, Southbank, TdF, The Sun, The Sun newspaper, Tour de France, Wham! Good work, but Easyjet’s policy on bringing bikes isn’t as easy! Be careful when you book, make sure it is ‘sports equipment’. Tell them it is sports equipment. All that brand building can be ruined by a stroppy assistant at Gatwick (or Luton! ).